The morning is enormously important. It’s the foundation from which the day is built. How we choose to spend our mornings can be used to predict the kinds of days we’re going to have. When I wake up in the morning, my mind gradually gathers, and I begin to move as the early morning light is just starting to seep through the windows. My family is still sleeping. It’s a peaceful beginning. I stretch, drink a glass of water, start the tea kettle, and practice a short journaling exercise for ten minutes. Then I enjoy a cup of tea as I read one chapter of a good book. And finally, I write on my laptop, diligently (disconnected from online distractions), for an hour before the hustle of the day begins. Once my family awakens, I pause to join them for a short time and we appreciate the full presence of each other’s company. It wasn’t always this way, however. I used to wake up in a hurry, rushing and cranky before stumbling into work and errands and meetings. It was unpleasant, but it was my life. I didn’t know any better, so I didn’t think I could change. Thankfully, I was wrong. Journaling is a priceless tool for self-reflection and self-improvement. J.K. Rowling keeps a journal. Eminem keeps a journal. Oprah keeps a journal. Successful people all over the world—those who consistently make positive changes in their lives—reflect daily and learn from their life experiences. And they often use some kind of journal to accomplish this. For the longest time, I knew the value of journaling—I heard the success stories of others—and yet I never took action. Why? Because I thought I didn’t have enough time for it. I was “too busy.” That was, until my ongoing negligence led to heightened levels of stress that literally put me in a hospital (my life was so disorganized and hectic, I started having panic attacks). I learned the hard way, but YOU don’t have to. Journaling was my first step to getting back on track. And it was a life-saver. If you’re interested in getting started with journaling, or if you’d like some fresh ideas for your current journaling practice, I’ve listed 31 journaling prompts below that I’ve personally used in the past to nudge myself into self-reflection. They will bring awareness to the subconscious beliefs and assumptions you have. And they will help you think through situations, big and small, and make better decisions. The mind is your battleground. It’s the place where the fiercest conflict resides. It’s where half the things you feared would happen, never actually happened. It’s where your expectations get the best of you, and you fall victim to your own train of thought time and time again. What’s one thought that has been getting the best of you lately? How has it been influencing your behavior? Happiness is letting go of what you assume your life is supposed to be like right now, and sincerely appreciating it for everything that it is. So, RELAX. You are enough. You have enough. You do enough. Breathe deep… let go, and just live right now in the moment. What do you appreciate most about your life right now? Why? A tiny part of your life is decided by uncontrollable circumstances, while the vast majority of it is decided by your internal responses. Let this sink in. Regardless of what’s going on around you, peace of mind arrives the moment you come to peace with what’s on your mind. What’s something you’ve let go that once meant the world to you? And, what’s something you love today that you never even knew you needed in your life? Most of the time you have a choice. If you don’t like a changeable aspect of your life, it’s time to start making changes and new choices. And it’s OK to be low-key about it. You don’t need to put everything on social media. Silently progress and let your actions speak for themselves. Over the past month, what have your actions been silently saying about your priorities? Are there any changes you want to make? If so, elaborate. The next step means nothing if you are in love with your comfort zone and simply walking in circles. Don’t live the same day 30,000 times and call it a life! Growth begins today, at the end of your comfort zone. Dream. Attempt. Explore. This moment is the doorway to anything you want. How have you stretched your comfort zone in the past month (even slightly)? What did you learn from this experience? What’s one new comfort zone challenge you’d like to conquer? Your capacity to be happy is directly related to the quality of people whom most closely surround you. So, be with those who are good for your mental health. Those who bring you inner peace. Those who challenge your bad habits, but also support your ability to change and grow. Who have you spent the most time with over the past month, and how have these people affected your life? Too often we say “life is not fair” while we’re eating our food, sipping a drink, and reading tweets on our smartphones. Think twice, and be thankful. At the end of the day, before you close your eyes, breathe deeply, appreciate where you are, and see the value in what you have. What is one privilege you have that you often take for granted? What kinds of physical clutter have been complicating your life and diverting you from meaningful life experiences? What’s something you often take too personally even though, logically, you know better? How has this habit affected your life? You can’t control how other people receive your energy. Anything you do or say gets filtered through the lens of whatever they are going through at the moment, which has nothing to do with you. Just keep doing your thing with as much love and integrity as possible. What’s one good, recent example of someone with a bad attitude completely misjudging you? How have you chosen yourself recently? How will you choose yourself, today? The wisest, most loving, and well-rounded people you have ever met are likely those who have been shattered by heartbreak. Yes, life creates the best humans by breaking them first. Their destruction into pieces allows them to be fine-tuned and reconstructed into a masterpiece. How has your past heartbreak made you stronger, wiser, and more loving? Be specific. What’s something from your past that you are thankful you gave up on? Why? What has your inner voice been trying to tell you lately? What does it mean? What’s something that’s worth working on today, regardless of what other people think? Why is it so important to you? What distractions have been getting the best of you lately? How often? Why? What’s one old pattern of behavior that sometimes still sneaks up on you? What’s a better alternative, and why? Your mind and body need to be exercised to gain strength. They need to be challenged consistently. If you haven’t pushed yourself in lots of little ways over time—if you always avoid doing the hard things—you’ll crumble on the inevitable days that are harder than you expected. How can you provide healthy challenges for both your mind and body on a daily basis? What will you do today to walk the talk? Everybody you meet is afraid of something, loves something, and has lost something. Know this. Respect this. And be extra kind. Take time to really listen. Take time to learn something new. Take time to say thank you. Today. What can you easily do to be a little kinder than usual today? And, who was the last person who was unexpectedly kind to you? How have your recent expectations of others gotten the best of you? What happened, and what have you learned? How will you embody “love” today? What specifically will you do? How far have you come? How much have you grown? Think about the specifics of your recent and long-term growth. What have you not given yourself enough credit for? There will come a time when you think it’s all over, everything is finished…you’ve reached the end of the road. That’s the starting line. Be humble. Be teachable. The world is bigger than your view of the world. There’s always room for a new idea, a new step… a new beginning. What does a new beginning mean to you right now? What is the first thing you will do with it? These morning journaling prompts mean almost nothing if they are not practiced consistently. One morning of journaling by itself won’t cut it. There is nothing immediately exciting about putting one foot in front of the other every day for weeks, but by doing so, many normal human beings have climbed over 29,000 feet to the top of the highest mountain in the world, Mount Everest. There is nothing immediately exciting about forcing yourself into self-reflection first thing in the morning, but by doing so, I (and hundreds of students and clients Angel and I have worked with) have drastically better lives. Remember, the mind needs to be trained to gain strength. It needs to be worked consistently to grow and develop over time. And that’s precisely what morning journaling will gradually allow you to achieve. If you don’t proactively push your mind in little ways every morning, of course it’ll stumble later on in the day when something doesn’t go your way. Choose to put one foot in front of the other from the get-go, when it would be easier not to. Choose to open your journal at dawn, when it would be easier to sleep in. M&A, the whole idea of investing in yourself and working out your thoughts first thing every morning resonates. And as I read over the journaling prompts #15 really jumped out at me. I used to struggle with this to no end. In fact, I found your work about three years ago when I was stuck in a moderate bout of depression. Between mind-wrenching career challenges and tough family obligations, my tank was totally dry. In a nutshell, I had been stretching myself too thin…I was giving all my energy to others and leaving absolutely no time to recuperate and grow. After reading your articles and emails, I signed up for your getting back to happiness course and completed the scheduled coaching with you. The little rituals we designed and implemented for overcoming my self-neglect and balancing my energy output have been a daily life-saver. And now, I’m going to add 10 minutes of morning journaling into the mix. Carey, your progress has been truly inspiring to witness. Thank you for the kind feedback, and great job! Keep those little rituals going. Hope everyone who reads this has a wonderful day. The entire write-up gives a useful and practical information known to many but practiced by a few. Let us try to bring it in practice with immediate effect. You are welcome. And thank you for pre-ordering our new book, Kevin. That helps us tremendously. 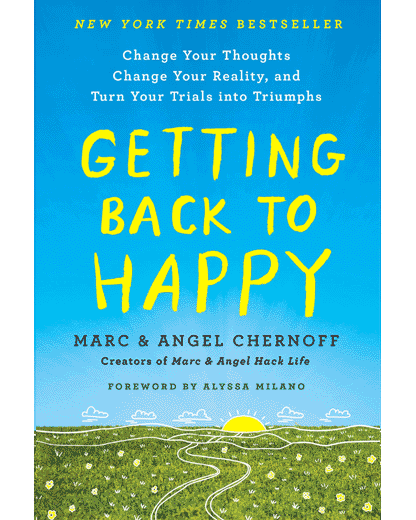 Angel and Marc, until I attended your Think Better Live Better conference last month I never thought about my daily rituals the way I do now–that what I do every single day either makes or breaks me. This write-up on morning journaling as a ritual was a good reminder, and surely pushes me to continue practicing what I’ve learned, in addition to cracking my dusty journal back open. Just small, consistent actions that start my days off right. Just a few short weeks ago, I never would have said that. I just wanted everything to be easier, rather than right. Anyway, thanks for making a difference over here. Cheers! Does it matter if you keep an electronic journal vs a handwritten one, thoughts? I think either one would work. Perhaps it would be helpful to ask yourself which method allows you to reflect more? Do you write better with one method or another? I used to write everything by hand. When I first learned to type, I would have to do my creative writing by hand and then type it. But as my typing became more natural to me, I found I could creatively compose by typing without writing it by hand first. The same thing happened when I learned to use the keyboard on the computer. I had to get comfortable with it to feel like I could be creative with that tool. Now, years later, I find that I pick and choose the method that fits the mood I am in. Some days, I just need to write it out by hand. And yet on other days, I find being able to put the words down almost as quickly as I can think of them works better for my creative juices. Pick the one that works the best to allow you to investigate and memorialize your thoughts. And realize that it doesn’t have to be the same one each day. Happy journaling. PS: Great article, A & M. thanks so much for sharing. a few days ago I have just changed from a paper to an electronic journal (with my iPad using an app called GoodNotes). I find it quite useful saving paper and keep it better away from prying eyes! You are right, Consistency is everything. This article will change many of your reader’s way of thinking including me. Thanks for providing valuable information, you have done lot of research on it. Keep it up. Great job marc may the lord continue to bless and keep you and yours to help bring such positive thinking to our community.peace & blessings. Journaling helped me move through so many challenges in my life. My mother had tried for years to get me to journal but it wasn’t until I understood that a journal is NOT a diary that I finally began. I started out simply with a spiral notebook and book of spiritual devotions. This eventually led to a daily ritual of contemplation and self-awareness. It became my saving grace. Hi Marc and Angel, I cannot express how wonderfully peaceful I feel as I read your life saving email and see some rays of hope, in an otherwise shattered life. I’m deliberately not reading the prompts until each day so they’re fresh. However, one phrase really jumped out at me: “paths are made by walking, not by waiting”. That is so pertinent for me – a champion procrastinator! Thank you. I’m looking forward to getting started on this. I already get up early as I love the peaceful time before other people are up and about. I shall now incorporate journal time into this special hour. Wonderful insights so painstakingly beaded together. Only a broad heart can give away the results of such a passionate and pointed research into one’s mind. Thanks again. Dear Marc & Angel, I have just red this article. It is very much motivating. All the 31 suggestions are so real that those seem to be emerged from the deepest corner of my soul. Thanks for providing us such a precious gift. Does it have to be done in the morning? I find that journalling before bed helps me out better than during the day. Is there a difference of when it’s done? Thank you M & A for your work of Kindness that you share to the world. Always Grateful for it. Your guidance is GPS for life. More power and Godbless you . I love this idea and have been trying to get my self started fora long time. The last 8 yrs have been a constant struggle with my husband first vocal cord cancer then a heart attack. The a peaceful couple of years now in the last 2 yrs the cancer has come back he had to retire due to the fact of losing his voice and having surgery. He is miserable and hates it he had to stop working but to make a long story short I try to wake up with a positive attitude everyday wondering what kind of mood he’ll be in etc. I want to start journaling to see if I can find myself in this constantly changing world. Thank you for your articles they help so much. I love journaling, especially when you get to come back years later and read what you wrote once you are in different space. This challenge is something that I might consider. This article really hit home for me. These are things I try to work on daily, and this is a great a reminder to keep on; I started a journal a few months back however, I have not been faithful in my writings. This has energized me to get back to it. Life needs reflecting so we can grow, to be the best we can be, stronger and happier. I truly believe in lifes journey, taking risks, and being in the moment/present. I started reading your blogs about 5 years ago from a friend who posted one on Facebook. I was in need of this that day and have been throughout the years. Thank you for sharing your experiences and wisdom, it truly makes a difference for me. I was quite skeptical about journaling until recently, and too decided that I was ‘too busy’ to reflect upon each day, but the benefits of it have been much greater than I could have ever imagined. It’s arguably the best way to declutter the mind and gain a more thorough understanding of our lives and our inner landscape. Thank you very much for sharing your insights and this very thorough, helpful guide – I will be exploring these prompts over the upcoming weeks for sure. I already journal every morning so I’m going to use these prompts to use intention when I journal for the next thirty days. When I first read this article, my own prompt helped me journal this morning, inspired by this post! So thank you for all your helpful insights all the time. I work out a ton of my issues on the page all the time. These will help that much more. Thank you again! In a word, elegant. Life perspective and ideas simply conveyed. I thoroughly enjoyed this, especially since I have been journaling successfully everyday since this year began. It has given me so much clarity and awareness and helped me get my power back. As a mother to 4 amazing kids, this is one of the activities that helps me stay centered. I began writing journals in around 1986, and decided that I would compile my writings into several bound journals. It was a great reflection reading and then rewriting from journals so long ago. What was important, how I felt, where I went and who was important to me at that time. I wish I had started writing in 1981, as it was a very turbulent time for me trying to deal with my parents divorce, and getting to university. All in all, the journaling experience has been rewarding and your ideas were superb. I have listed them at the front of my newest journal and plan on visiting each of them in the near future. I love reading your (what do they call them, blogs?) almost everyday…they have helped me become a better person, and helps me not to be hard on myself. I’ve been reading them for about 5 years now, and I’ve never left a reply. Just silently absorbing the information you give me. I felt it was time to “thank you” for writing these blogs. I’m gonna take your advice and try journaling everyday, and see if I can put to rest some of my issues. They’ve been weighing me down to long. What if you want to journal but the fear of others possibly seeing your thoughts is overwhelming? The thoughts that you usually keep to yourself in your mind and your heart, the conversations that you have with yourself that no else hears but you, the situations and conversations and scenarios that you make up in your head that never actually come true. Do you only write the positive and not the negative? This is definitely a very good read, in fact it has offered me just the motivation I needed to stat off my days on a high note. Going to start this routine this morning!